The name of [Chez] Flicoteaux [Restaurant] is engraved on many memories. Few indeed were the students who lived in the Latin Quarter during the last twelve years of the Restoration and did not frequent that temple sacred to hunger and impecuniosity. There a dinner of three courses, with a quarter bottle of wine or a bottle of beer, could be had for eighteen sous; or for twenty-two sous the quarter bottle becomes a bottle. Flicoteaux, that friend of youth, would beyond a doubt have amassed a colossal fortune but for a line on his bill of fare, a line which rival establishments are wont to print in capital letters, thus—BREAD AT DISCRETION, which, being interpreted, should read "indiscretion." Flicoteaux has been nursing-father to many an illustrious name. Verily, the heart of more than one great man ought to wax warm with innumerable recollections of inexpressible enjoyment at the sight of the small, square window panes that look upon the Place de la Sorbonne, and the Rue Neuve-de-Richelieu. Flicoteaux II. and Flicoteaux III. respected the old exterior, maintaining the dingy hue and general air of a respectable, old-established house, showing thereby the depth of their contempt for the charlatanism of the shop-front, the kind of advertisement which feasts the eyes at the expense of the stomach, to which your modern restaurant almost always has recourse. Here you beheld no piles of straw-stuffed game never destined to make the acquaintance of the spit, no fantastical fish to justify the mountebank's remark, "I saw a fine carp to-day; I expect to buy it this day week." Instead of the prime vegetables more fittingly described by the word primeval, artfully displayed in the window for the delectation of the military man and his fellow country-woman the nursemaid, honest Flicoteaux exhibited full salad-bowls adorned with many a rivet, or pyramids of stewed prunes to rejoice the sight of the customer, and assure him that the word "dessert," with which other handbills made too free, was in this case no charter to hoodwink the public. Loaves of six pounds' weight, cut in four quarters, made good the promise of "bread at discretion." Such was the plenty of the establishment, that Moliere would have celebrated it if it had been in existence in his day, so comically appropriate is the name. Flicoteaux still subsists; so long as students are minded to live, Flicoteaux will make a living. You feed there, neither more nor less; and you feed as you work, with morose or cheerful industry, according to the circumstances and the temperament. At that time his well-known establishment consisted of two dining-halls, at right angles to each other; long, narrow, low-ceiled rooms, looking respectively on the Rue Neuve-de-Richelieu and the Place de la Sorbonne. The furniture must have come originally from the refectory of some abbey, for there was a monastic look about the lengthy tables, where the serviettes of regular customers, each thrust through a numbered ring of crystallized tin plate, were laid by their places. Flicoteaux I. only changed the serviettes of a Sunday; but Flicoteaux II. changed them twice a week, it is said, under pressure of competition which threatened his dynasty. Flicoteaux's restaurant is no banqueting-hall, with its refinements and luxuries; it is a workshop where suitable tools are provided, and everybody gets up and goes as soon as he has finished. The coming and going within are swift. There is no dawdling among the waiters; they are all busy; every one of them is wanted. This central portion of Lost Illusions is one of the high points of my ongoing project to read all of Balzac's La Comédie Humaine. At the end of the Scènes de la vie de province section, it follows the impressionable young poet from Angoulême, Lucien de Rubempré, as he pursues the woman he loves to Paris. 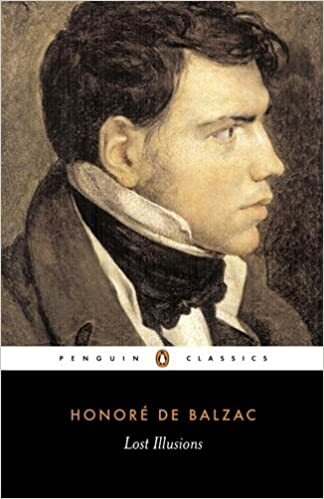 Lucien goes through most of the self-discoveries Balzac himself made, falling into desperate poverty, meeting a group of sincere writers, and then being seduced by the easy money of journalism. Balzac's descriptions of the more squalid corners of Paris, as well as the less savory aspects of the publishing business in the 19th century, are based on first-hand observation and a delight to read.